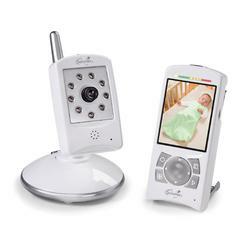 For parents looking for the ultimate stylish color video monitor that allows them to view baby both day and night theres the Sleek & Secure Handheld Color Video Monitor from Summer Infant. Its small, sleek and stylish design makes parents feel like their watching their little one on their cell phone. Its todays most sought after baby monitor and gives parents the reassurance they need by allowing them to hear and see baby.